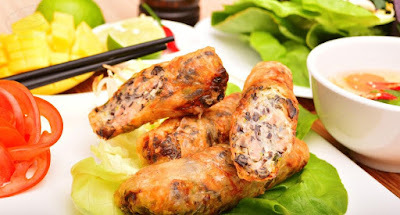 There is a dish that can be served all year round, and present in almost every menu of Vietnamese restaurant abroad: A dish that is so famous that many locals of Vietnam assume it as their own specialty and give it their own name such as: the dish is given the name “nem cuốn”, depicting its shape. Meanwhile, the Southerners call it “chả giò”. 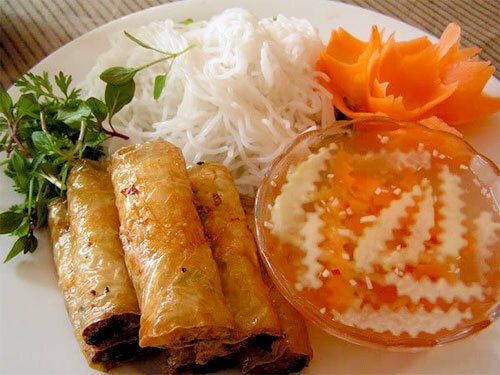 Spring rolls is not always accompanied with rice but can also be eaten with round noodle in the mouth-watering “bún nem “dish. 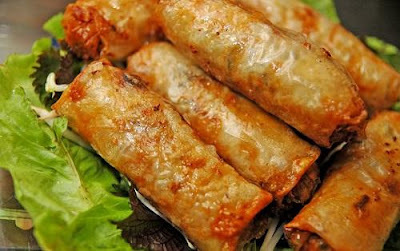 To Vietnamese people, fried spring roll is the embodiment of tradition, skillfulness, quintessence of Vietnamese fine cuisine. For an authentic taste, all the ingredients must be carefully chosen and prepared. 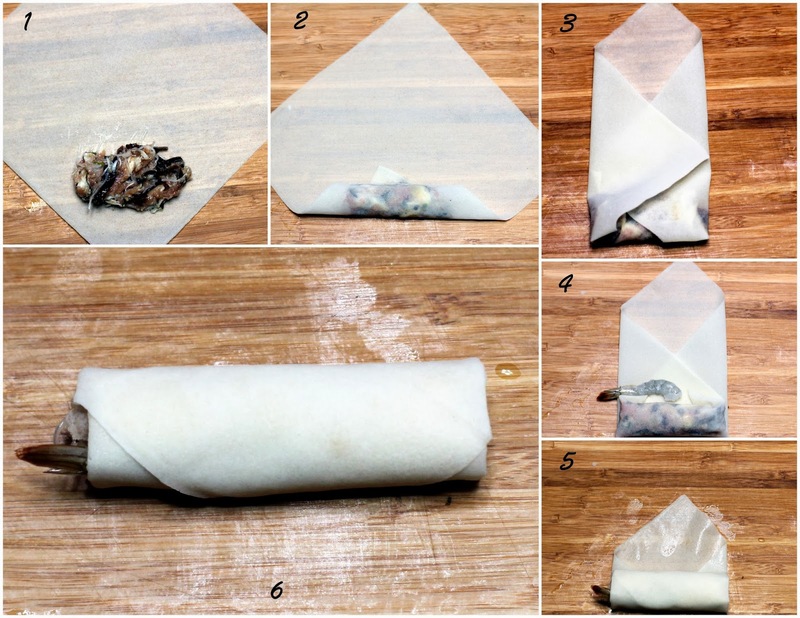 Ingredients used for the fried spring roll are different depending each local but usually it comprises of lean minced pork, sea crabs or unshelled shrimps, edible mushroom, dried onion, duck/chicken eggs, pepper, salt and different kinds of seasoning. There are also special variants of the traditional pork-based roll, such as Crab spring rolls or Nem Cua Be. Optionally, dried shrimp can be added for more flavor. 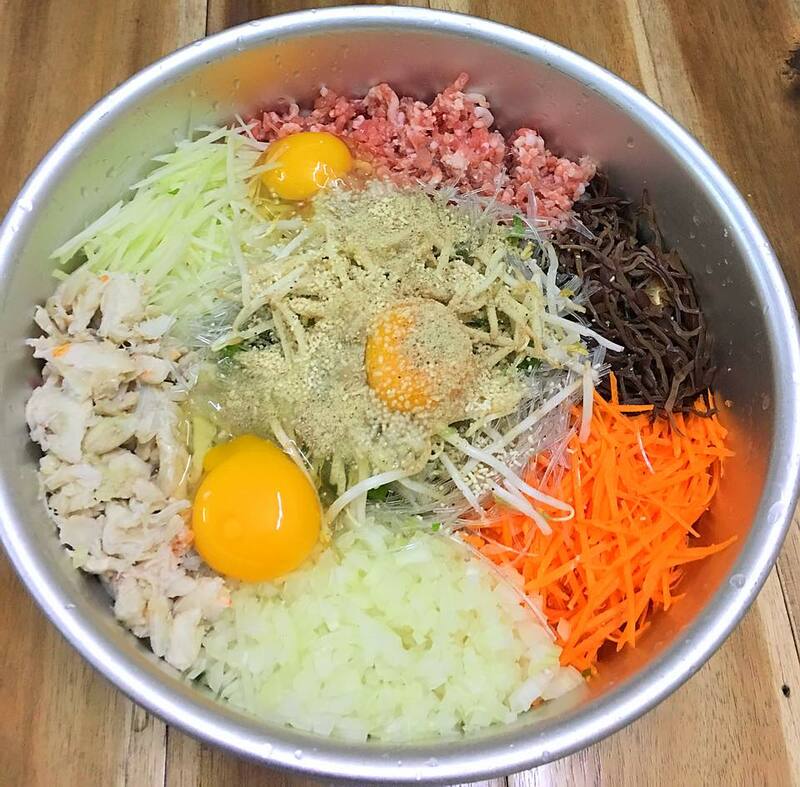 The ingredients will then be seasoned with salt, pepper, and mixed thoroughly before being wrapped with thin rice paper into small rolls. 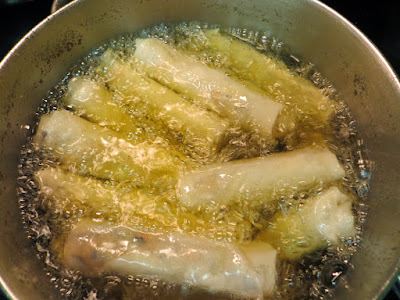 These rolls are then fried in boiling oil until golden. The dish itself is a masterpiece but it’s not yet complete without the perfect-made dipping sauce. 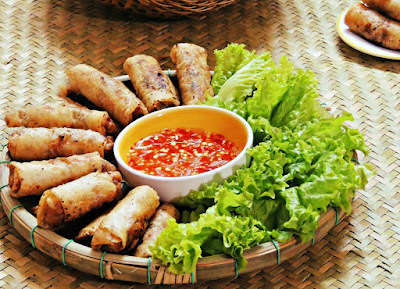 A quality dipping sauce should be the harmonious combination of nước mắm (savory fish sauce), a bit of sugar, salt, umami, some drop of lime juice or vinegar. Water, pepper and fresh chilli will then be added and adjusted to suit the one’s reference. Spring roll is always served with herbs and vegetable, namely cilantro, lettuce, etc. Step 1: In a large bowl, combine the minced pork and minced shrimp together and season lightly with salt, pepper, sugar and chicken stock (1/2 tsp each). Also add 1 tbps minced shallot and 1 tbsp minced garlic. Mix well in a circular motion till combined. Step 3: To soften the rice paper for wrapping, moisten the rice paper with a damp cloth instead of soaking in water. Step 5: Heat a generous amount of oil in the pan until you see small bubbles around the chopstick. Then keep the heat on medium and start frying. The rice paper could be sticky at first so leave some spaces between the rolls. After a few minutes, it's ok to bring them closer to one another. Deep fry until they turn golden brown.